The conclusion for the live semi-finals of The Voice Kids is finally here as four of the young artists were able to enter the finals of the competition. 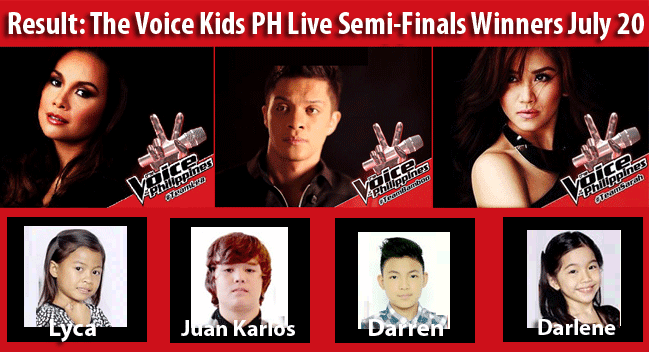 The names of the kids are Lyca, Darren, Juan Karlos, and Darlene. These kids have shown exceptional talents that made the people support them through texting. When it was about time to reveal who among the six were lucky to be included in the list of four kids who will enter the finals next week. This is based on the number of votes the audience has given to push them up. When one of the hosts counted five seconds which was the only remaining time, there was tension already inside the venue. The coaches stood with two of their kids. They gave compliments to their kids when they were called. After that, the names were called. While the names were being called, the kids were emotional, along with their family members. The first one to be called, in no particular order was Lyca, next was Juan Karlo, Darlene was the third and the last was Darren. The two (Tonton and Edray) were recognized.